In 1936 the State Theater first opened its doors in Falls Church Virginia, but not as a concert venue. The State Theatre’s first purpose was as a movie theater. Its first film was Thanks a Million staring Dirk Powell. The family-owned theater was the flagship movie house of the Neighborhood Theatre chain and was the first East Coast movie house to operate with central air conditioning. The company also owned the Glebe, Jefferson and Buckingham theaters, all of which have since been repurposed. The State Theatre ran as a picture house through November 27, 1988. It’s final movie was Die Hard, with Bruce Willis. Following the final movie, the theatre underwent a multimillion dollar restoration and was converted into the State Theatre of today. The theatrical stage and 200 seat balcony are the original as are the lobbies; however the auditorium seating was removed to allow for dancing, dining and bars. The State was one of the few picture houses with a balcony and that has served it quite well as a concert venue for those who want to sit during the show. The theatre also has two bars and provides patrons the ability to enjoy a meal during the show through its full service restaurant. The theatre can also be used for private events. 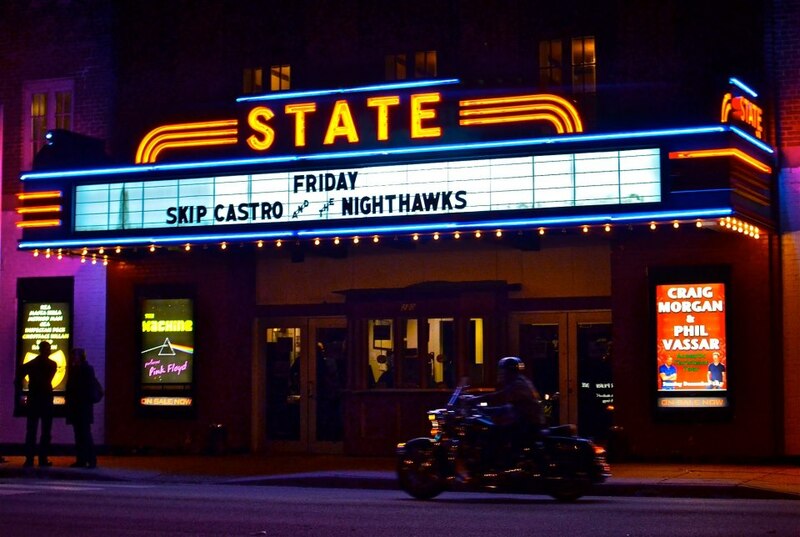 Check out these upcoming events at the State Theatre! THE HACKENSAW BOYS Friday, October 24, 2014 – 7:00 PM get tickets! ALMOST QUEEN Saturday, October 25, 2014 – 7:00 PM – get tickets! THE LEGWARMERS FRIDAY Friday, October 31, 2014 – 8:00 PM – get tickets! THE LEGWARMERS SATURDAY Saturday, November 1, 2014 – 8:00 PM – get tickets! Deerhoof Friday, November 7, 2014 – 7:00 PM – get tickets! THE MAVERICKS Saturday, November 8, 2014 – 7:00 PM – get tickets!